Almost exactly 45 years ago, the first ecologist candidate to the French Presidency, agronomist René Dumont, professor at the Institut National Agronomique, warned us against waste and particularly waste of water and he ended his speech on television by drinking a glass of water [see video in French]. Despite his long experience as a field agronomist around the world, he was not taken seriously and continuously had to use a large proportion of his speaking time to provide evidence of his credibility. And today, what is the situation? The water issue has become a daily concern. This is true in poor countries in tropical areas, but also in rich countries, in the mediterranean region and even in temperate areas where availability of water seemed to be secured in the past. In France, for example, as spring is starting, official water warnings have already been issued in the Nord, Creuse, Puy-de-Dôme, Rhône and Ain “départements”, and in October 2018, 62 “départements” had been in a situation of water restriction [read in French]. At world level, around 80 countries have people suffering from water problems and 450 million people are regularly confronted with situations of lack of water, the frequency and intensify of which is expected to increase with the on-going climate change. Nearly half of humankind lives in river basins where physical availability of water is insufficient and around 1.6 billion people live in areas where, if water is physically available, it is not accessible for human, institutional or financial reasons. Moreover, while water is lacking in quantity, its quality also has become a problem: it has been deteriorating as water is being polluted by agricultural run-offs and industrial waste, as can be seen in France [read in French] or the UK [read], from repeated disasters in Brazil [read] and the degradation observed in China [read] or India [read] where water quality has become a serious concern, particularly in the States where there is a very intensive agriculture. Faced with this worrying issue, however, humankind adopted an irrational and inconsistent attitude similar to that of a group of persons lost in a desert mountain area who would decide, instead of rationing their food, organise a big feast and consume happily whatever food is left to them. Indeed, massive investment made that the area equipped for irrigation in the world was multiplied by almost 3 over the last 60 years, according to FAO, while the use of chemical fertiliser and synthetic pesticides continues to grow strongly. In France, irrigated area was trebled between 1970 and 2010 to reach almost 9% of total used agricultural land. This increase of irrigation went along with the development of maize for fodder linked to the growth of intensive livestock production and occupying almost half of irrigated area [read in French]. In short, we have increased our dependency on an unreliable and diminishing resource, and generated more risk of pollution! 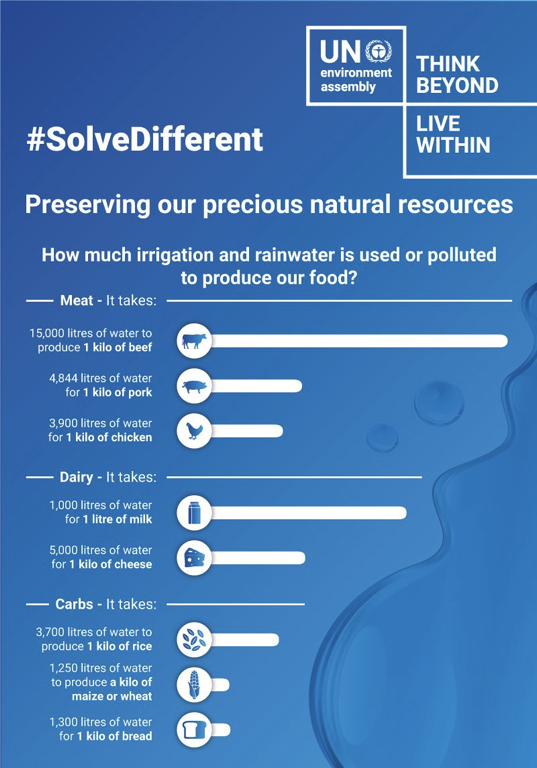 Globally, agriculture is by far the most important water user (around 70% of the total); consequently, our dietary choices have a strong impact on the use of water. The diagramme below gives an idea of the amount of water required to produce some important food items, knowing that this quantity may vary, of course, depending on the way in which they are produced. 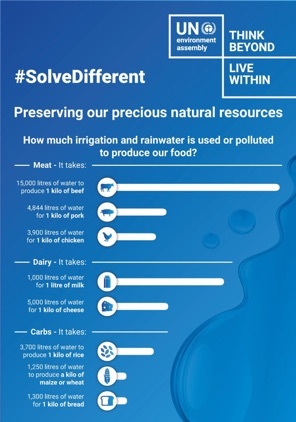 For example, the amount of water required to produce a kilogramme of beef produced in an intensive feedlot may reach as much as 100,000 litres of water in extreme situations, compared to the average 15,000 litres, but much less for animals reared on natural pastures! (see diagramme below). It is therefore important to find out how a particular food item has been produced. How much irrigation and rainwater is used or polluted to produce our food? Knowing that it is estimated that in France a person uses around 200 litres per day for daily requirements such as hygiene and sanitation, compared to only 30 litres per day and per person in an African city [read in French], it is worthwhile finding out what the water consumed through our food amounts to. 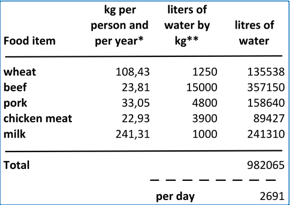 The result is quite impressive because if your consider all the water required for producing wheat, beef, pork, chicken meat and milk consumed on average by a French individual, it represents more than 10 times their average daily water consumption (see table below). Evidently, this water consumption is made of three main types: rainwater (for most of the wheat and part of animal products), irrigation water (for a part of the meat production as livestock consume around half the grain produced in the world and half of fodder produced - of which part is irrigated), and public or private drinking water (for daily requirements, but also for watering livestock). •By changing our daily habits (use of flow restrictors on taps, short showers instead of baths, dual flush toilets, etc.) [read] and by limiting to a minimum the use of plastic and by recycling it as much as possible [read]. Changing our diet will also help reduce greenhouse gas emissions produced by agriculture [read] without generating any nutritional problem, quite the contrary. If deeply reformed, public policies implemented by our countries can make this reorientation easier [read]. In particular, it will be required to abandon the inegalitarian and very costly strategy of ‘‘all-out irrigation’’ and invest more resources in public research for selecting crop varieties and cultivation technologies that are better adapted to the evolution of climatic conditions and of water availability. This will not be easy, as powerful lobbies, such as the Malabo Montpellier Panel tirelessly promote irrigation [read] and mechanisation of agriculture [read] in Africa, for the benefit of large public works companies, the automobile industry and private investors. At the start of this century, we have finally understood that R. Dumont was right. Now, we have to act before it is too late. •Striepe, B., 20 Ways to Conserve Water at Home, Care2, 2019. •Watts, J., 'The river is dying': the vast ecological cost of Brazil's mining disasters, The Guardian, 2019. •Water pollution, BBC News, 2019. •Chandrashekhar, V., Dying Waters: India Struggles to Clean Up Its Polluted Urban Rivers, Yale Environment 360, 2018. •Pervasive plastic: from food in plastic to plastic in food, 2018. •Climate is changing - Food and Agriculture must too, 2016. •Meat Atlas: an uncompromising picture of meat in the world, with some reasons for hope, 2014. •Water and Hunger - The ‘‘all-out irrigation’’ strategy has led to a fragile, wasteful and inegalitarian system, 2013.